American artist; born at New Haven, Conn., March 15, 1848. He received a public-school education at San Francisco, whither his family had removed in 1855, and studied art under Fortunato Arviola in the same city in 1864. In 1865 he went to Munich, where he studied under Piloty at the Royal Academy until 1876, when he returned to San Francisco. 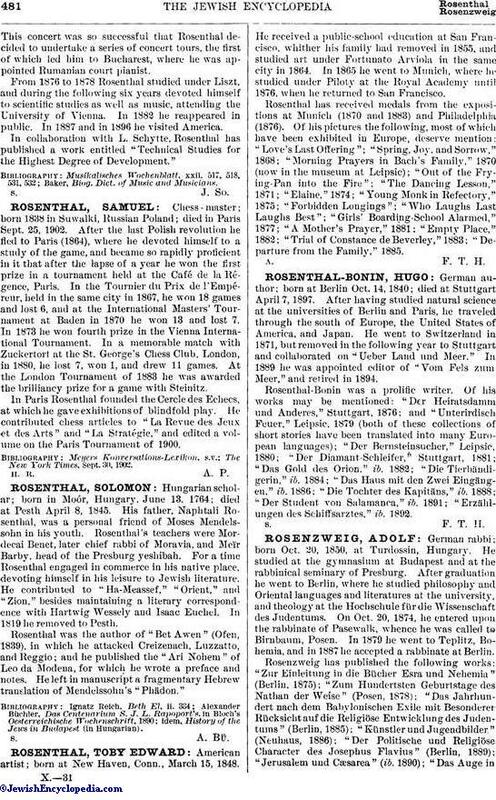 Rosenthal has received medals from the expositions at Munich (1870 and 1883) and Philadelphia (1876). Of his pictures the following, most of which have been exhibited in Europe, deserve mention: "Love's Last Offering"; "Spring, Joy, and Sorrow," 1868; "Morning Prayers in Bach's Family," 1870 (now in the museum at Leipsic); "Out of the Frying-Pan into the Fire"; "The Dancing Lesson," 1871; "Elaine," 1874; "Young Monk in Refectory," 1875; "Forbidden Longings "; "Who Laughs Last Laughs Best"; "Girls' Boarding-School Alarmed," 1877; "A Mother's Prayer," 1881; "Empty Place," 1882; "Trial of Constance de Beverley," 1883; "Departure from the Family," 1885.